Boating Technology, Fishing With Dynamite! Comments Off on Boating Technology, Fishing With Dynamite! BREAKING NEWS: Winter is coming. We know…Trust us, we know. And fishing ain’t like it used to be. Remember fishing when you were a kid? Grandpa would wake you up. He’d be in his full regalia, ready for any and all lake creatures willing to do combat. You’d stop by the local convenience store, buy a styrofoam cup filled with dirt and nightcrawlers. Pull out the old motorboat, park it just offshore of “his lucky spot”, he’d make you pull out said worm and laugh as you were grossed out by sticking it with your hook, cast your line, and wait. You’d drive back to the dock, with memories, but unfortunately, no fish. Fishing Technology Has Changed Everything! We’re all familiar with GPS technology these days. Whether it’s assisting us from getting from point A to point B, let us know what cool Asian fusion restaurants are nearby, or whether it’s creeping us out asking what we think about this store we walked by but never actually walked in. When it comes to being on the water, GPS technology can provide a landscape above and below the water of where you are, can monitor where your boat is, if you let your son, daughter, sibling or friend borrow it, and GPS technology can also help you find fish! The Hummingbird Helix Series is a line of GPS tracker/fish finders we sell here at Woodard. Side Imaging: This patented technology reveals the world beneath the surface with 480 feet of side-to-side coverage. High-frequency sonar cuts through the murky water with crystal clarity, while the wide coverage area scans huge areas fast. Down Imaging: Get a clear view of what’s happening below your boat with Down Imaging. As you patrol the water, you’ll watch timber, brush, bridge pilings, rocks and any other structure pop with great detail. Dual Beam PLUS Sonar: Two beams combine for great detail and a generous coverage area, helping you identify fish, structure, and contours. Use the narrow beam for high-accuracy returns of fish, structure, detail and the bottom profile. Opt for the wide beam when you want a larger search area. You can view the beams separately, side-by-side or blended together for the complete picture. Your coverage area will be equal to your depth. LakeMaster Compatible: Upgrade to the unrivaled accuracy and detail of Humminbird LakeMaster maps. From easy-to-read contours to highlighted depth ranges, to scrollable lake lists, you’ll have all the tools you need to make every moment count. Crocodile Dundee fishes with a stick of dynamite. Do yourself a favor, check our site often as we will be traveling around doing numerous boat shows. 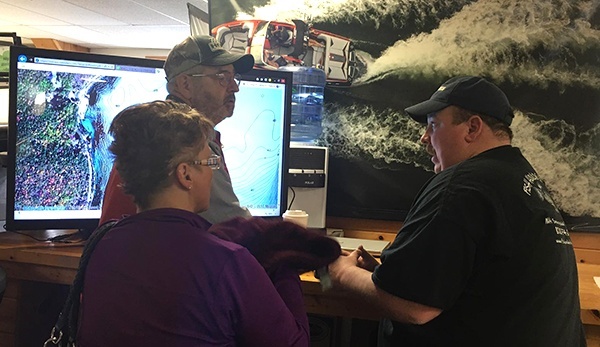 At our boat shows, we have the ability to create an experience with a fishing pro who will show you the underwater sonar mapping and hot fishing spots. Sure, the memories with Grandpa are, and will always be priceless. But since GPS Technology is here to stay, why don’t we go home with some fish too.